Self-consciousness is just another way of saying self-centredness, and self-centredness really is the root of all grief. People grieve or are unhappy for a lot of reasons. But, if they analyze it, they would find that it is always the result of self being deprived of wants. So, the answer to dealing with grief can be found in dealing with self. For example, financial problems often come when we try to live above our means, attempting to fulfill self-centred desires. It’s not that I am against prosperity—I’m not. But it’s important to have the right perspective. If you’re miserable or unhappy over the fact that you don’t have a bigger home, a newer car, or a wide-screen television, something is wrong. It’s our self-centredness that turns a want into a need and then that need into a personal crisis. God has already promised that our needs are met in Him and that they will be added to us as a byprouct of seeking His kingdom first. It’s completely unnecessary to focus our attention on trying to get something from God that He has already provided. When we do, it leads us right back to the door of self-centredness. Even in the case of the death of a loved one, our grief is rooted in our personal loss. We focus on the situation from our point of view: How can I go on without them? I won’t ever see them again on earth. We convince ourselves that we are mourning over the death of these people, but it’s really over how it will affect us. If that person was born again and is now with Jesus, it should be a time to rejoice. Let’s imagine the atmosphere at a believer’s funeral if, rather than focusing on our own self-centred thoughts about losing them, we focused on the person and what they were experiencing being with Jesus. Instead of grieving, what an exciting time of thanksgiving and praise it would be! What happens when you humble yourself (with the correct understanding of true humility) and God starts to exalt you? The truly humble will let Him, but the proud won’t. They are too concerned about what others think and will try to deflect it by debasing themselves. It’s just another form of pride. However, if we focus on becoming dead to self and alive in Christ, we will probably fail. I used to resurrect self every morning in prayer while trying my best to kill it. I confessed all of the sins I thought I had committed: “Pride! Arrogance! Failure to study the Word!”On and on it would go until at the end of my devotional time, I had spent the entire time focused on myself. Stupid, stupid! In a day when self is being exalted to the max, understanding the consequences or the fruit of self-centredness is critical. In the end, it will only lead to grief. To help you, I have a booklet called Self-Centredness: The Source of All Grief. Or you can get the message on a single audio CD. It may ruffle a few feathers, but it will help you understand the truth about self-centredness. And if you’re willing to apply what you learn, it will set you free from the grief you’re experiencing in your life. 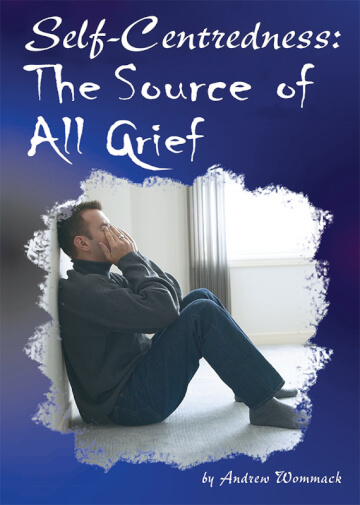 If you are breathing, you have a self, and you should read this booklet. So, order several copies of the booklet, CD, or both, and make them gifts to your friends and family—they’ll thank you for it. To help, I’ll give you the first booklet or CD free; to obtain this click here for the free request form. To purchase further copies of the booklet for £2.99 each or the CD for £3 each, visit our shop or call our Helpline: +44 (0)1922 473300 between 7:30 AM and 4:00 PM GMT. P.S. Jamie and I never cease thanking God for you and your continued support. We are embarking on the greatest project we have ever attempted, and with your support, we will get it done, debt free. Thank you so much for helping us to make disciples who will change the world. You are a blessing.